PathPoint’s mission is to provide comprehensive support services to people who have disabilities and disadvantages to live and work as valued members of the community. Ms. Burton first came to PathPoint when it was known as Work Training Programs in 1987, and she has held her current position since 1994. After the monthly board meeting was adjourned, colleagues, friends, and community supporters from the years gathered at the offices on West Haley Street to surprise Cindy. Among the attendees present were former board members, and partners from Mullen & Henzell L.L.P and Walpole, Inc. A reception followed the surprise. Burton received a BA degree from UCSB and passed the qualifying exam for Certified Public Accountant in 1991. Burton’s sensitivity to and interest in programs for people with disabilities and disadvantages is influenced by her personal experience; her sister had profound intellectual disabilities. In 2010-2011, PathPoint served more than 2,300 people with disabilities and disadvantages in Santa Barbara, Ventura, Los Angeles, Kern and San Luis Obispo counties. 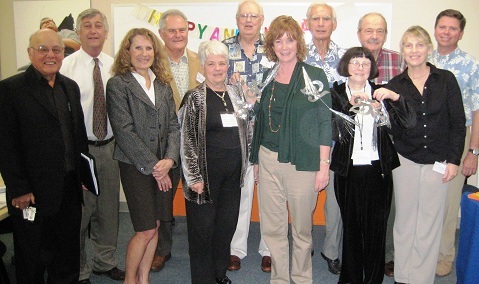 In November 2011 the Goleta Chamber of Commerce named PathPoint Goleta’s Finest Non-Profit Organization. For more information about PathPoint programs contact info@pathpoint.org. To make a contribution to honor Ms. Burton’s dedication, donations may be made through the website www.pathpoint.org. All donations make a difference and are greatly appreciated.